'The Moorings', the Walter Scott Cameron residence in Southampton. Cameron was a sportsman and Master of Hounds for the Meadow Brook Club. 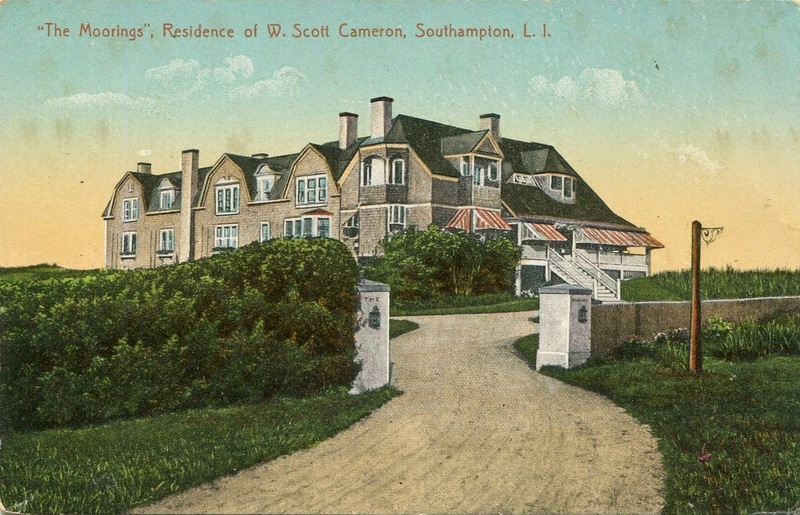 A longtime Southampton resident, Cameron owned a couple of houses in town (and has a beach named after him in Bridgehampton). He purchased 'The Moorings' in 1907 with his first wife, Rosalie deGoicouria and renamed it 'Wee Hame' after his subsequent divorce and remarriage to Cicely Mary Hilger. It appears the house has since been demolished but it sat on Gin Lane. What a coincidence. This house is called 'The Moorings' also. And though my road is not called Gin Lane, there is a bottle in the freezer should any of you drop by when the sun goes 'round the yardam.